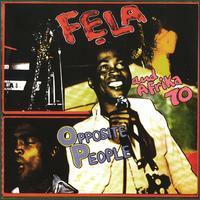 Opposite People/Sorrow Tears And Blood are my favorite albums from Fela. Although I would recommend Shakara/London Scene as a good introduction to Fela's music, this reissue is recommended as a follow-up. "Opposite People" starts off with a bluesy, yet swinging, guitar-riff. The musical style is very similar to Shakara. But the listener will instantly notice the furious sax soloing by Fela, and some of his musicians, that make Opposite People smoke. The focus on composition, and creating grooves, is high on all four tracks. Sorrow Tears And Blood was the first album released by Fela after his initial troubles with the Nigerian government. His increasing criticism of the military goverment forced them to raid his home and confiscate newly recorded masters. Fortunately, after a lengthy court battle, those master tapes were returned and released. A masterpiece!